A number of old 'Doctor Who' characters are to save Matt Smith's Time Lord in a one-off TV special. The time-traveller is set to be rescued from danger in a special episode of 'The Sarah Jane Adventures' - which will be called 'Death of the Doctor' - where four former Time Lords, two ex-assistants and a number of old enemy's make their TV return. Former Tardis regulars Sarah Jane Smith - played by Elisabeth Sladen - and Jo Grant, portrayed by Katy Manning, are to unite on screen as part of an adventure to rescue The Doctor, in a story penned by former 'Doctor Who' boss Russell T. Davis. Actress Lis said: "Uniting the past and present is a real homage to 'Doctor Who'." However, Steven Moffat - who is behind the latest series of the show - has joked that Russell's script-writing return has proved to be problematic. He quipped to the Daily Star newspaper: "Typical. We invite Russell back and he tries to kill off The Doctor." Fans of the sci-fi shows will see characters Sarah Jane and Jo pair up to rescue The Doctor after they are tricked into believing he has been killed, and invited to his funeral. But the pair quickly realise the ceremony is a trap, and learn that a group of aliens called The Shansheeth have captured the Tardis, leaving the Time Lord stranded on a planet. These vulture-like aliens then attempt to use a "memory weave" to connect with the pair's brains and past thoughts, and learn how to unlock the time-travelling machine through their past experiences with The Doctor. As they reminisce, viewers of the show will watch video flashbacks of previous Time Lords William Hartnell, Patrick Troughton, Jon Pertwee and Tom Baker, whilst their iconic nemeses The Daleks, Sea Devils, Sontarans and Davros also make a return. 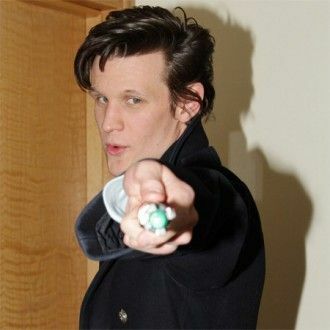 Matt will also make a special guest appearance in the show in the new series of 'The Sarah Jane Adventures', which begins next Monday (11.10.10).